What do you get for € 849 next to your watch? We can talk a very long time about all the specifications of the Sealander and why we think it’s the best choice under a thousand USD. But that’s not what we are going to do in this text. Here you can find all the accessories you get next to the watch and why they contribute to let the watch become a ‘real life’ tool watch for watch enthusiasts, by watch enthusiasts. The Sealander is delivered not only within a piano black lacquered luxury box, but also within a handmade leather watch roll. We wanted to give the owner of an Eza Sealander a packaging that not only gives it a luxury gift feeling, but also a packaging that you can actually use in daily life. 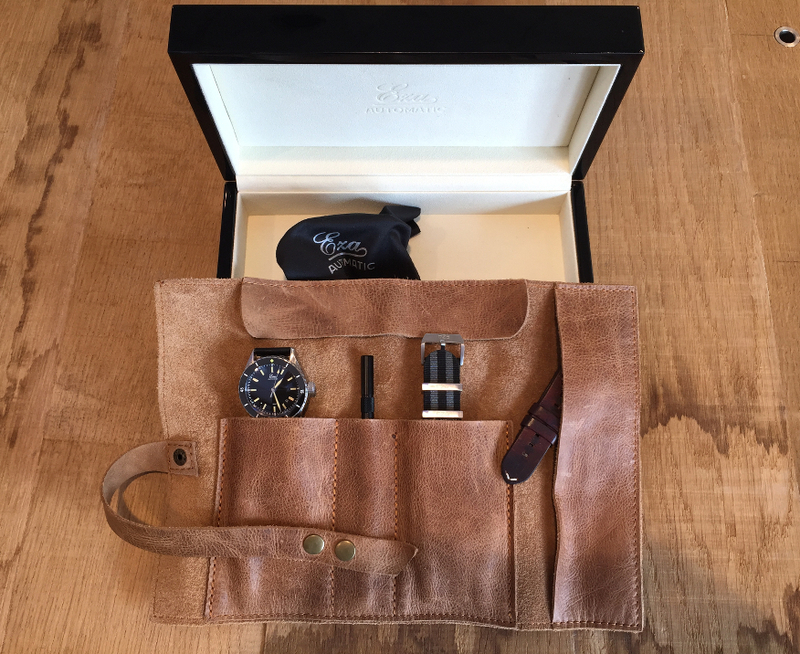 The watch roll is an excellent device to bring your watch and watch related stuff with you on a holiday or business trip. The watch roll is equipped with 2 places for your Eza watch and another watch you like to bring (maybe a second Eza in the future). In between there is a place for the pushpin tool. This is a tool with the logo of Eza, just like the one on the case back and the crown. This is specially made to easily change your strap and/or buckle. All the way on the right in the watch roll, you can find a special storage place for extra NATO or leather straps. When you roll the watch with everything inside and click close it, you can put this in your suitcase without having to worry about any scratches on the metal case. Every surface is covered with the soft leather of the Eza watch roll. In the piano black lacquered box you will also find an envelope with a personal letter form Adriaan and Diederik with your personal warranty code. With this letter you will have 2 years of warranty on the product after the purchasing date. Next to the letter we provide you with the test results on the movement that is specially adjusted in six positions in our own atelier in the Netherlands. To finish the complete package, you get an Eza branded polishing cloth which helps you to keep your watch clean and shiny every day!